« Barrel Tasting Weekend at Korbel! Members of the Wine Road would like to welcome you to their wineries and lodgings for an exciting weekend of wine tasting. 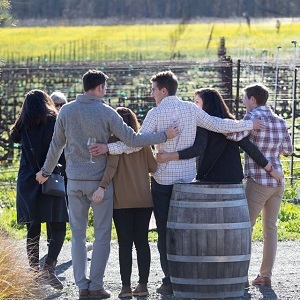 This is your chance to sample wines from the barrel, talk to winemakers and explore the beautiful Alexander, Dry Creek and Russian River Valleys. Barrel Tasting is not a food pairing or themed event. It’s all about the WINE…many wineries offer “futures” on their barrel samples. This is a chance to purchase wine now, often at a discount, then come back to the winery when the wine is bottled, typically 12-18 months from now. Many wines are so limited, buying futures is your only chance to purchase them. Previous Event Listing Barrel Tasting Weekend at Korbel!